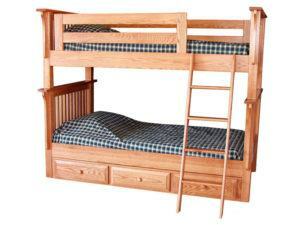 Presenting a wide selection of solid hardwood bunk beds from Brandenberry. They include twin over twin and twin over double sets, plus units with integrated desks and drawers. So we got you covered. Plus, Amish artisans build them all. For great looks, sturdiness and long life. 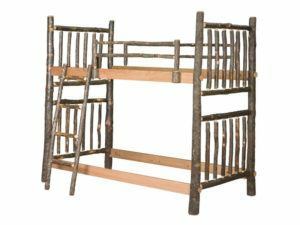 Sturdy wood slats accent the durable Ladder Bunk Bed. 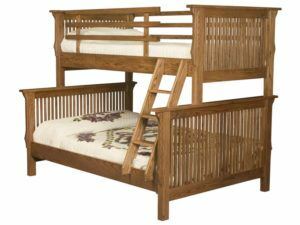 The Pine Hollow Bunk Bed Unit is a perfect furnishing for the growing family. There is an ample amount of storage with built in shelving, desks and drawer units. 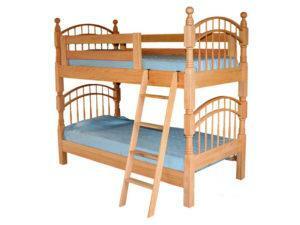 Delicate curves and sturdy construction meet in the Pine Hollow Double Bow Bunk Bed. Beautiful Mission construction highlights the Pine Hollow Mission Bunk Bed. The timeless Mission style highlights the Pine Hollow Prairie Mission Bunk Bed. With just about every combination of wooden bunk beds represented in the collection above, you’re sure to find the unit that strikes your fancy. So check out the single over single sets. Plus the single over double units. Also the beds with integrated drawers and desk. Sturdy construction. 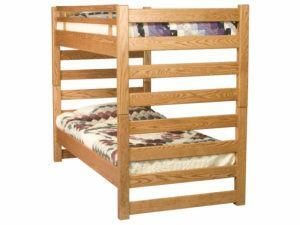 Skilled Amish cabinetmakers build each bunk bed. And they use solid hardwoods, like oak, maple, cherry and hickory. So you won’t find bargain substitutes like particle board here! No wonder the units are so sturdy! 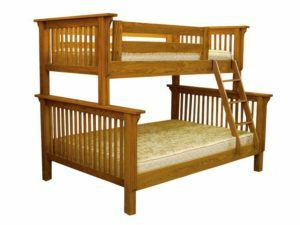 In fact, you don’t need to worry about whether the bunk bed you choose can withstand the increasing weight of your growing children. Plus, with proper care, your Brandenberry beds should serve your family for decades to come. Customize to your heart’s content. You can order the bunk beds you like as shown. Or, you can let us customize it to your specs. For starters, you can choose the wood specie and finish. You can also specify the style and setup. Plus hardware, on some units. 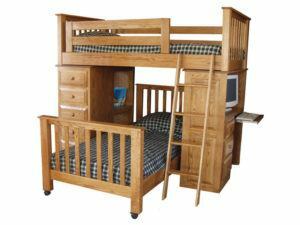 Also, if you don’t see what you’re looking for – such as a triple bunk bed or a queen bunk bed — be sure to contact us. We’ll customize a bunk bed set to fit your home and lifestyle.